We shall not fail or falter; we shall not weaken or tire. Give us the tools and we will finish the job. There are a lot of lies going around...and half of them are true. Arise and take our stand for freedom as in the olden time. Dogs look up to you. Cats look down on you. Pigs treat you like equals. Why, you can take the most gallant sailor, the most intrepid airman or the most audacious soldier, put them at a table together - what do you get? The sum of their fears. He is a very modest man with a great deal to be modest about. The destiny of man is not measured by material computation. When great forces are on the move in the world, we learn we are spirits--not animals. War is a game that is played with a smile. If you can't smile, grin. If you can't grin, keep out of the way 'til you can. It is hard, if not impossible, to snub a beautiful woman - they remain beautiful and the rebuke recoils. Socialism is a philosophy of failure, the creed of ignorance, and the gospel or envy, its inherent virtue is the equal sharing of misery. Truth is incontrovertible, ignorance can deride it, panic may resent it, malice may destroy it, but there it is. Politics are almost as exciting as war and quite as dangerous. In war you can only be killed once, but in politics, many times. The great principle which this house ought to guard and cherish is that, when the tax collector comes to the private citizen and takes from him of his wealth for the services of the public, the whole of that money taken shall go for the purposes for which it is intended, and that no private interests, however powerfully they may be organized and however eloquently advocated, shall thrust their dirty fingers into the pie and take the profits for themselves. 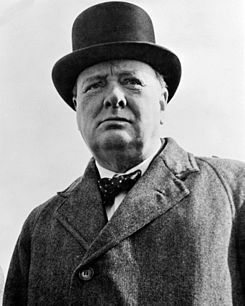 87 quotes by Winston Churchill.